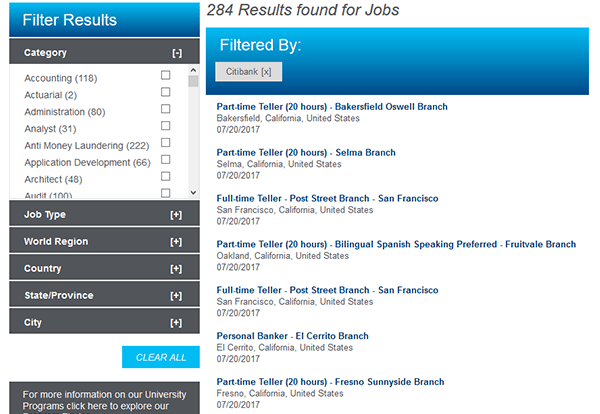 The Citibank job application, available via the company’s employment site, can be used to apply for numerous types of positions. Examples of some of the careers that can be searched/applied for online include accounting, administration, banking, IT, support, business, operations, marketing, and finance positions. Learn more about the company’s online job search and application processes by following the steps in the instructions posted below. More Information About the Company: Citibank is an American chain of banking centers based out of New York City. The company is the consumer branch of Citigroup. The company has more than 2,000 locations across the world, with the large majority of locations being in the United States/North America. Step 1 – The first step of the online job search process is to go to the company’s main employment website. Click here to open the careers/employment site in another browser tab/window. 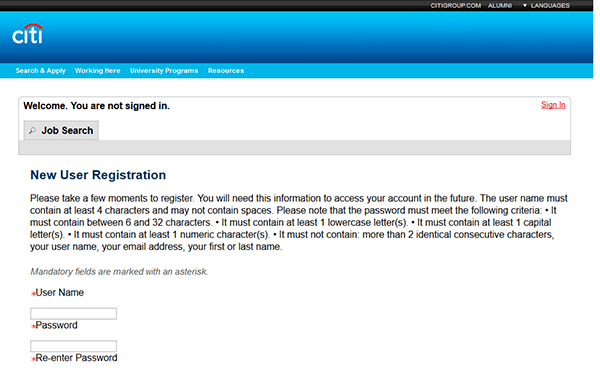 Step 2 – Click the “Advanced Search” link, and then select “Citibank” from the “Category” drop-down list. Click the “Search” button to load the results. Step 3 – Scroll down the page to view the list of current openings. The results can be filtered by category, job type, world region, country, state/province, or city. Press the title/link of the career that you’re interested in applying for. 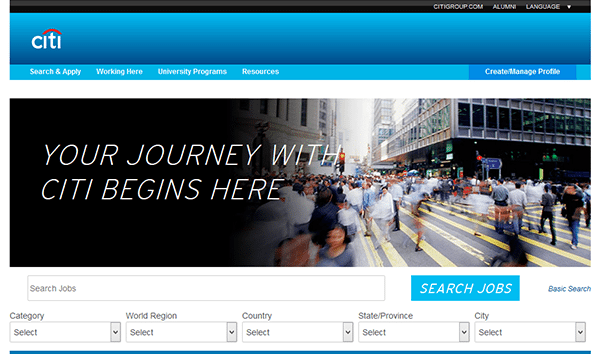 Step 5 – Click the “Apply Now” button to go to the next step of the process. Step 6 – Click the “New User” button to go to the account creation form. Step 7 – Read/accept the privacy agreement. Step 9 – Once your account has been registered you will be able to begin the online application process. Submit any/all required details for each section/subsection of the form.